After my husband and I were married my mother-in-law gave me a bread machine. I have never made bread before and had always bought it from the store. The first couple of loaves that I made turned out okay, not great. Then I finally found my groove and made approximately two loaves a week. Eventually the bread machine broke and I decided that instead of buying a new one I would make my bread by hand. I fell in love with hand made loaves. The texture and shape were so different and there is something so therapeutic about kneading bread. Today I modified a new recipe for Homemade Crusty Bread to be baked in dutch oven for a perfect crust. The recipe I modified has 4 ingredients. It takes 4 hours of total time, a half an hour of which is active and makes 12 servings. I made a number of modifications to the original recipes. First I did not use a mixer to make my dough. Instead I kneaded my dough by hand for a total of 8 minutes. I combined the flour, salt and yeast and then added the water and stirred using a plastic spatula. Then I kneaded the dough. I followed the rests the same as the recipe. However, instead of two loaves I made one large loaf. For the cooking of the bread, I pre-heated a dutch oven at 425 degrees for a 1/2 hour during the breads final rise. Then I put the bread in the dutch oven, put on the lid and let it bake for 30 minutes. After 30 minutes I took off the lid and let it cook for an additional 15 minutes. The crust on this bread turned out perfect. My boys and husband loved it. It would be great for grilled cheese sandwiches or just with butter. Using the dutch oven was perfect for making a great crust, but if you don't have one the steam method used in the recipe would be an alternative. Overall a great recipe that I would definitely use again. 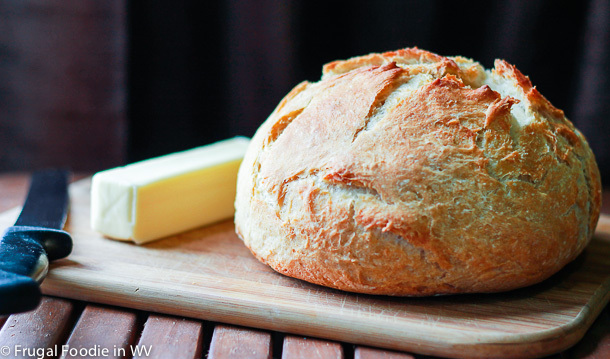 For the recipe go to Homemade Crusty Bread. Thanks for the sweet comments :) The crust turned out perfect thanks to the Dutch oven! I used to bake fresh, homemade bread by hand, too, every day. I have never thought to use the dutch oven! Super clever! Now following/stalking you all the great ways we get to. Found you via the HOF Weekend Blog Hop. Have a BLESSED weekend! You can also use any oven proof casserole dish that is deep enough and has a lid. For my Irish soda bread I use two cake pans, one as a bottoms and one turned over as the lid. It works great! I love cheese fondue, but I haven't made any in a long time, yum! Homemade warm bread is like crack! That looks amazing. Thanks :) I agree that it's very addicting! Wow, that looks like some really good bread! I totally agree - kneading bread is therapeutic! My husband always says we should get a bread machine, but I don't want one! He doesn't understand haha. Your bread look so delicious! This looks great - and do-able. The wildly famous no-knead recipe does not satisfy my need for instant gratification - I think this recipe would. I have had horrible luck with no knead bread. They tend to take forever to rise and I don't have the patience to wait 12-16 hours :) If you try the recipe tell me how it to goes! That looks so good.............Thank you for sharing with the Clever Chicks Blog Hop this week; I hope you’ll join us again!